With apologies to all. Our conference is convened to address the question: “What should an art school be (whither or wither the arts and humanities)?” My presentation this afternoon, however, is not concerned with the shape of a particular art school curriculum. Instead, I want to argue for the crossdisciplinary, cross-cultural importance of the study of liberal arts—i.e., arts and humanities--in the education of all students. My argument is anecdotal, and based on three experiences. In 1998, quite unexpectedly, I was asked to teach a course on environmental ethics(1) to students enrolled in the university's Faculty of Agriculture and Environmental Sciences. The semester had already begun. That week 45 Ag students had walked into their classroom to find no instructor. Someone had forgotten to hire someone. Clearly, this course did not rank high on anyone's list of priorities. Had I ever taught “environmental ethics” before? No. But I had just published Sacred Art of the Earth (2) a study arguing the earth-centered ethic of much contemporary land art. How had I determined this? I'd asked the artists. Questionnaires and interviews. In all, 120 artists contributed to my study. Generous with their time, forthcoming with their answers. Well-known artists, too. The findings—both questionnaires and interviews- -were consistent: as a group, the artists had felt numinous moments walking the land. Moreover, they wanted others to “see, really see” the earth in those terms, too. Their work, as environmental artists, I concluded, was ethically intended. As their instructor, I wanted my students to understand, to appreciate deeply, that whatever it is we point at and label “the environment,” this (pointing, naming) is itself an enculturated event—be it landscape, seascape, cityscape, God's land, the Big Apple, whatever... . The “virgin forest” is not unseen, it is not ever terra incognito. In the first class meeting, we covered a lot of ground. I handed out copies to all of the United Nations “World Charter for Nature.” Passed by the General Assembly in 1982, the Charter's dicta are comprehensive. (5) There are 24 in all, and they leave nothing out—war, poverty, genetic engineering... . The Charter became a constant reference in class discussion. a. What is a landscape; or, who-sees-what-when-where-why? Each week I loaded images of environmental art into my trusty Kodak 35mm carousel slide projector. I needed the work of artists for my lectures because... Artists are really good at making complex ideas comprehensible and VISIBLE to others. Following each slide or film presentation, I broke the class into discussion groups of 6-8 students, presenting each group with a different question to be discussed in the next 7 or 8 minutes. Each group chose one of their cohort to present their findings. My role was to summarise, comment, synthesise. The students liked small group work, and grew more confident week by week in their use of visual data as primary evidence for their arguments. The students were also responsible for writing two field reports. The first field assignment was an exercise in observation skills. (7) The students were instructed to keep sensory field data notes throughout a 48-hour period of silence. (8) No talking for 48 consecutive hours. “What do you mean by 'sensory data? '” the students asked. “Good question,” I replied. “How many do you want to count? Not every culture limits sense data to five--seeing, hearing, smelling, touching, tasting. (9)( Not even us. Sixth sense? Sense of balance? Rhythm? Time?” We agreed all would track the Aristotelian five, but be alert for other possibles, too. 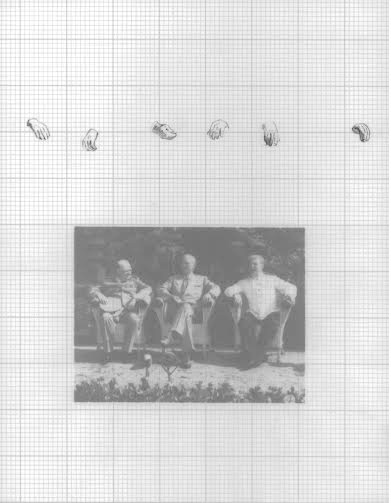 For the second field report, the students designed and conducted sets of semi-structured interviews with two different groups of people—those who had lived all their lives in rural Quebec, and those who had emigrated as adults to the region from another country—in order to compare and contrast the answers obtained. The questions the students asked their informants concerned perceptions of the environment: e.g., the amount of snow, summer temperatures, numbers of songbirds, etc. At the end of the year, I was sorry to wave goodbye to my School of Agriculture students. They had been a wonderful class. The students evaluated me quite highly, too, and the Ag School Dean was very pleased. I have made use of those same techniques—48 hours of silence, interviews, visual analysis—here, there, and elsewhere—wherever I have landed, regardless of the Faculty in which I have landed, because the best classes are the one where the students are teaching me. Group work and field reports keep my eyes open, too. Twenty-five years ago, 1989, the Berlin Wall fell. My daughter walked into the living room to find me weeping in front of the TV. “Mom, Mom, what's the matter?! !” “Look,” I replied, “Look ! They're dancing on the wall and no one is getting shot.” I then explained what and why the wall. The Cold War was ending. It took a while for the import of all that to sink in everywhere. In Canada, for example, the very secret “Diefenbunker”(10) in the village of Carp, just outside of Ottawa, remain staffed 24/7 by the Department of National Defence for five more years. Not until 1994, would DND begin to think about decommissioning the place. The Diefenbunker is mammoth. It is a bomb shelter carved deep, four stories deep, into the rock of the Canadian Shield. Built to house 535 people, mostly men, the structure was designed to be a nuclear bomb shelter, one sturdy enough to survive a 5-megaton nuclear blast. The shelter has 300 rooms. It was completed in 1961. The government of Canada expected there would be war. Moreover, when the bomb went off, the Government expected to be able to run away and climb down into its hidey-hole, then 30 days later, emerge and return to work. Peace, order, and good government. The Canadian way. Radiation? Fallout ? All would be gone by then. If any remained...? Nothing that a good sweep and scrub could not clear. “Mutually assured destruction” was the strategy of the day. Madness. But, if the Cold War is over, of what use is the bunker? Carp's secret bunker became a community museum in 1999, ten years after the fall of the Berlin Wall. Its architecture and furnishings have not been changed. Pillows and sheets are still on the beds. 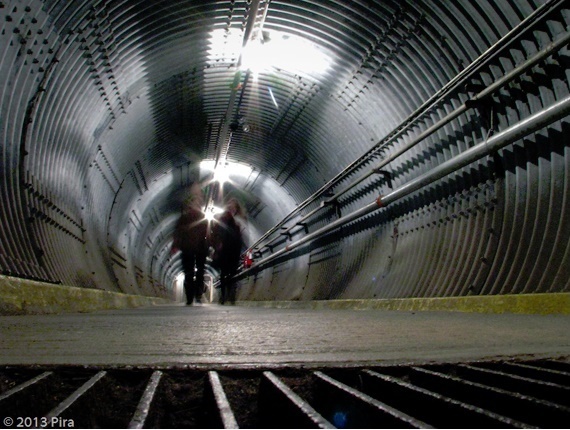 Visitors enter through the bunker's 378-foot blast tunnel. The temperature is always cold, distant footfall echoing in the tunnel and corridors. In 2000, the museum's opening was marked by a large, international exhibition of the work of 13 artists. There have been smaller exhibitions since. 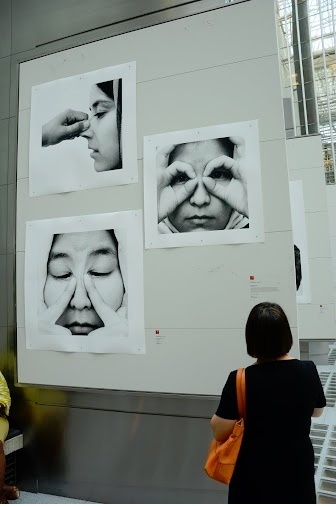 The vault intended to hold the gold of the Bank of Canada has become a gallery used, for example, to display temporary exhibitions ranging from children's art to Hiroshima photographs. 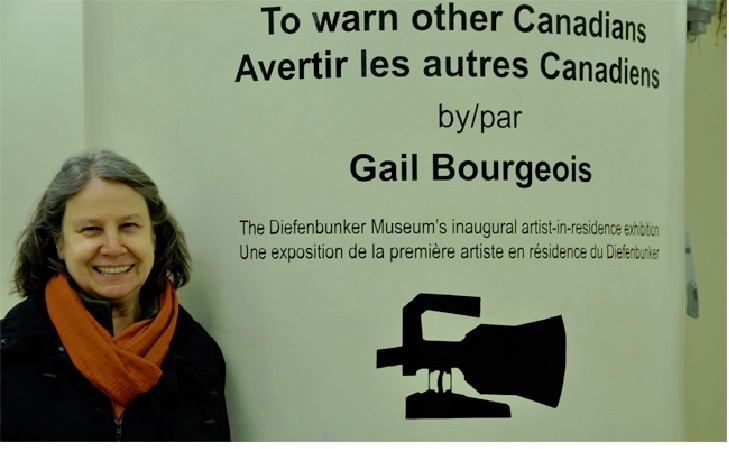 In 2013, Gail Bourgeois began a six-months artist's residency at the Diefenbunker. The first artist to hold a residency at the museum, Bourgeois knew how to investigate the site, how to read the documents in the library, how to listen to and look closely at the stories told. Gail Bourgeois is an American emigré, long resident in Canada, and a Canadian citizen. Her education at West Liberty State College, West Virginia and Concordia University (MFA) in Montreal had included a solid background in literature, as well as history. 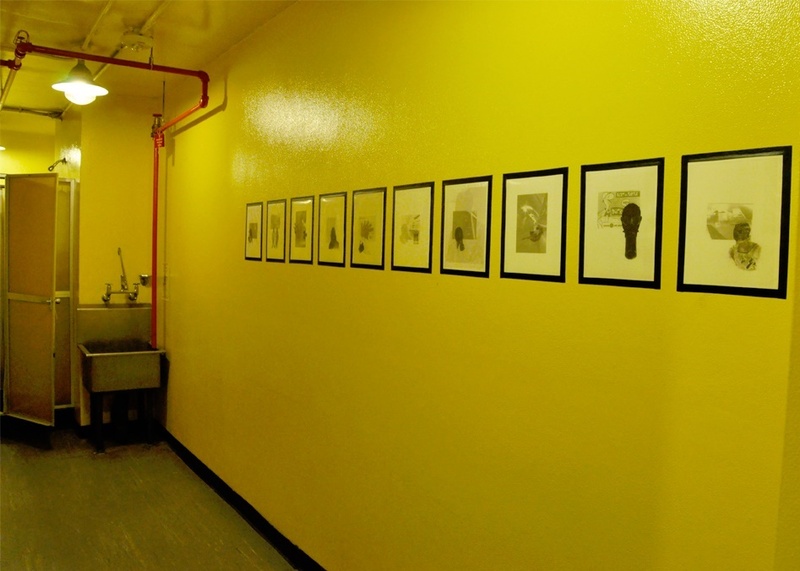 At the Diefenbunker, the artist had an uncommon opportunity to learn both site and story intimately. “To Warn Other Canadian”--a series of 120 drawings, a fragmented frieze in situ at 20 different sites inside the bunker–is the outcome. 5. Gail Bourgeois. To Warn other Candidans. 2014 Details. cafeteria wall. Gail Bourgeois' work unfolds site and story with an artist's intuition of ancient precedent. The Parthenon's interior frieze of the Panathenaic procession has been destroyed, but its storyline—the walk of a people seeking protection—continues right into our time. It is a storyline Bourgeois found echoes of in her work at the Diefenbunker. To construct the frieze fragments, Bourgeois layered Mylar sheets over declassified documents, archival photographs and imagery, graph paper, and prints. She then drew in direct response to the layered data, scanning layers to make 112 injet prints, each print protectively shieflded and bordered with black tape. The prints were taped together to form fragmented storylines aligned in black-edged registers. They appear to have been part of the walls for the last 50 years. In some sense that is true. Things happened here. The walls have ears. The most important feature of the residency for the artist's work, however, was permission to walk the rooms and corridors, over and over again, hour upon hour. Walking intensified the artist's sense of spatial relatedness—room to room, ceiling to hallway—and, the knowledge of the tales told in these rooms. The architecture became a thing-in-and-of-itself, its volumetric forms poked and prodded by memory. The artist marked the location of her work with a simple stencil posted nearby—the black ilhouette of an air raid siren. There were no titles, captions, or explanatory texts on any wall to accompany the imagery. Visitors were given a map to find their way independently. Decontamination Room, level 400, Diefenbunker. The Decontamination Room, level 400, for example, is entered through a shower, its walls painted acrid yellow. 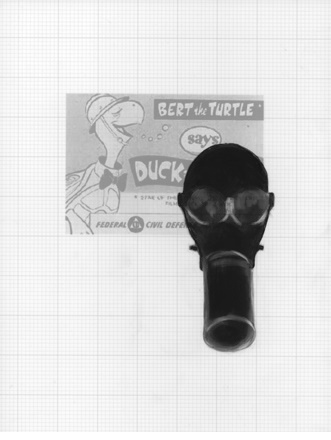 A black air raid stencil turns the eye to a wall with figures in gas masks, HazMat suits, and children's schoolroom posters—Bert the Turtle, Duck and Cover. Gail Bourgeois. Cold War Pieces: Bert the Turtle, 2014. In the Health Centre, level 400, are four hospital beds, an isolation room, and an x-ray machine. One frieze includes Notes on Nuclear Warfare for Medical Officers by command of the War Office, 5th April 1952 and a young girl's photograph. She is naked and runs screaming—the MyLai attack. This is what happens and what can be done next. Down on level 300, the walls of the CBC Emergency Broadcast Studio have four collations of imagery—each a Cold War topical reference to the world outside, references familiar to those inside. Drawings of burnt bodies, black crows, and jesters are braided into newspaper stories of spies, trials, food shortages, and photographs of the bunker's own blast tunnel. Would those outside have let others in? No. When war is done, we memorialize the dead. But if a war has not been fought in blood, what story is told? In this work, Gail Bourgeois collapsed time lines between what-happened-then, what-we-knew-when, and.....what is today. The work is a warning: Duck and cover. The warning is timely. Afghan artist Hanifa Alizada of Kabul is a photographer. Six years ago, she was one of my first-year students at UNESCO Madanjeet Singh Institute of South Asian Arts, Beaconhouse National University (BNU), in Lahore, Pakistan. 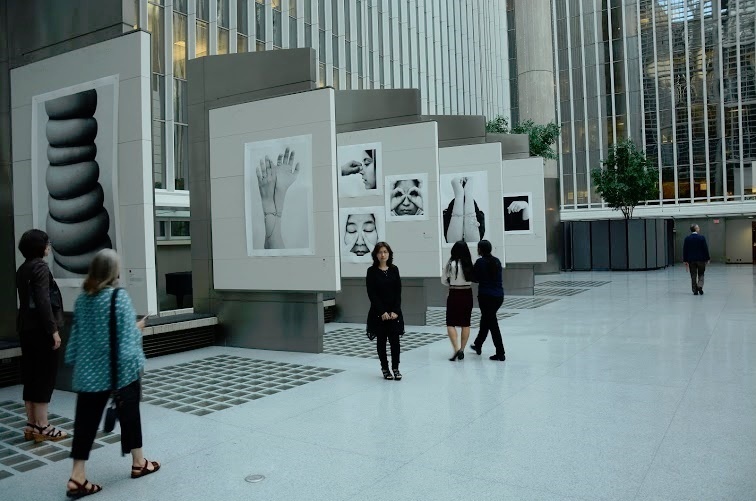 Today, she is the first artist to have her work sent on tour by the World Bank. 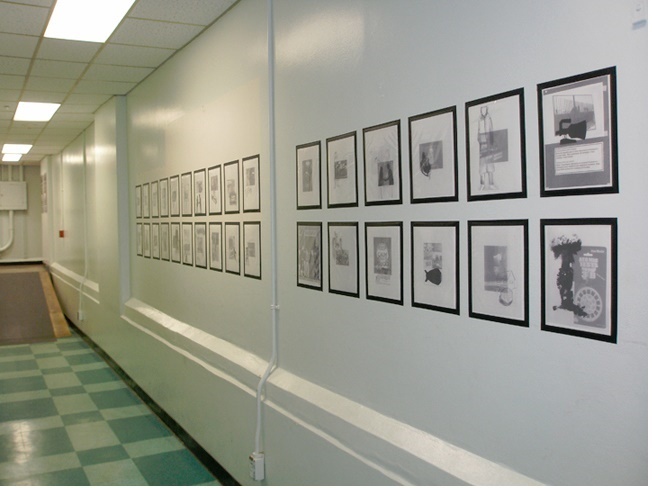 “Through the Eyes of a Woman” is a solo exhibition of Hanifa Alizada's photography. 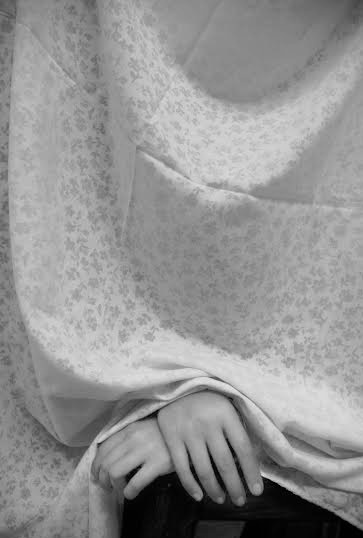 Curated by Marina Galvani, it is part of a World Bank initiative entitled “One in Three,” a title denoting the numbers of women worldwide brutalized violently, or “one in three.” The exhibition program debuted this summer in Washington, accompanied by two theatre plays and two panel discussions, in addition to Hanifa Alizada's photography. Hanifa Alizada Through the Eyes of a Woman, 2014. Installation view with artist 3rd from L. The World Bank, Washington, D.C.
My student has generously credited her art history classes with me as a catalyst for the work. Nonsense. Hanifa Alizada is brave, tough, diligent, very smart, and VERY observant. She also had the good fortune at BNU to be one of Malcolm Hutcheson's photography students. Hanifa Alizada, 2014. 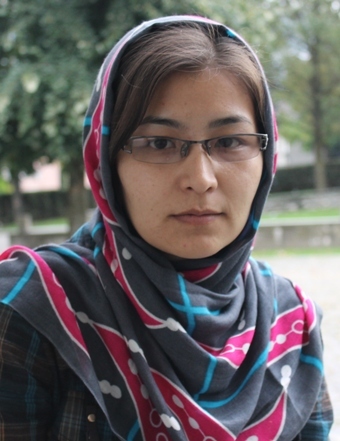 The World Bank, Washington, D.C.
Born in Ghazni, Afganistan, in 1989, Hanifa Alizada is part of the Hazara people, a minority tribe in Afghanistan, who are mostly Shi'a Muslim. During the Taliban takeover, the family was particularly endangered by their faith and their ethnicity. 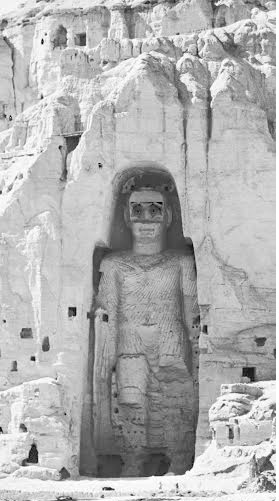 In the artist's study, “The Price of Breathing,” we see not only a reference to the Taliban's efforts to destroy the Bamiyan Buddhas, we also see the necessity to witness, to remember. The family fled to Iran in 1997. Hanifa was 8. As refugees in Tehran, their lives were constrained, and schooling restricted. Afghan children could not attend schools past grade 7. The Hazara people are distinctive in any group. They claim descent from the Mongols. 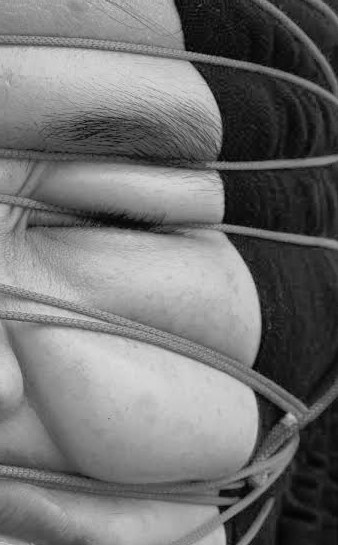 Hanifa Alizada's series entitled “Die to remain alive” presents cruelly the desire for round eyes, straight nose, for some way to look like others, to “pass” for one of them. Then, one would be safe. In 2002, the family returned to Kabul. The Allied invasion of Afghanistan had cleared a narrow pathway. 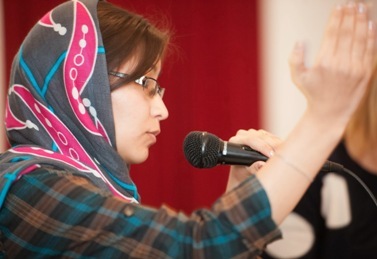 Hanifa Alizada graduated from Marefat High School in 2007 and was awarded a scholarship permitting her to attend BNU in Pakistan. Hanifa Alizada arrived in Lahore in 2008, on her own, not knowing Urdu, finding Punjabi foods strange, and the weather.... hot! My introductory class in art history was a sharp awakening. Wrapped in her veilings, she sat front row centre. Came the first test, she failed. So did most of the class. Badly. Most with grades of less than 20. How come? The students had been taught to memorize answers, perfectly. They had no experience with tests for which the answers were not already known. Three weeks later, yet another test...and a better outcome. Many passed and passed well. What had happened in between? My classroom practice of small group discussion, each group using visual evidence to make arguable points, had now become the students' own extra-curricular practice, too. Nightly in the women's dorm, the students were debriefing one another, using their own notes for argument. Sitting down in study groups. Nightly. Moreover, several of the students said this was Hanifa's idea. Hanifa Alizada. Mona Liza, 2011. black-and-white photography. From the dawn of time, human history is one of gestures made in the dust for others to see. 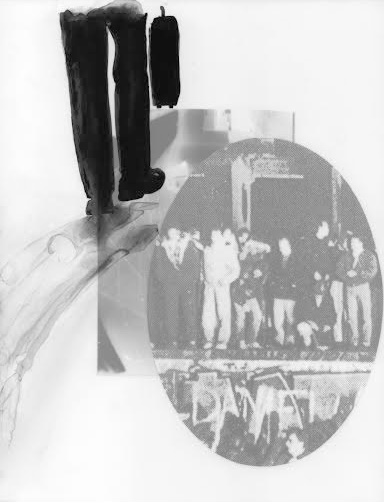 In the work of both Gail Bourgeois and Hanifa Alizada, we see people walking, people seeking protection from harm. conviction that her work matters, too. Knowing what others have seenprovides all of us with a measure of our humanity. Art saves lives. In hard times, that truth cannot be said quietly, or set aside conveniently. 1. Ethics and the Environment was a cross-listing shared by the Faculty of Arts with the Faculty of Agriculture and Environmental Sciences at McGill University, Montreal. The chair pulled my application from a pile of applications leftover from an earlier full-time faculty search. 2. Maureen Korp, Sacred Art of the Earth (New York: Continuum Publishing, 1997). 3. The study of cultural perceptions of the environment is an interdisciplinary field sometimes called “topofilia” (love of the earth) in recognition of the importance of geographer Yi-Fu Tuan's classic study by that name. See Yi-Fu Tuan, Topofilia: A study of environmental perception, attitudes, and values (New York: Prentice-Hall, 1974). See also by the same author, Landscapes of Fear (New York: Pantheon Books, 1979) and Paul Shepheard, The Cultivated Wilderness: or, What is a Landscape? (Cambridge, Mass. : The MIT Press, 1997). 4. This theme comes up throughout Yi-Fu Tuan's work. See, for example, Yi-Fu Tuan, “Geopiety: A Theme in Man's Attachment to Nature and to Place” in Geographies of the Minds: Essays in Historical Geography in Honor of John Kirkland Wright, David Lowenthal and Martyn J. Bowden, eds. (New York: Oxford University Press, 1976), pp. 11-39. 6. In addition to Yi-Fu Tuan's work to structure our discussion, I outlined Ninian Smart's “six dimensions of religions” template and James Livingston's discussion of ethics as road maps for our work. 7. The importance of visual and spatial perception as a mode of knowing is, of course, not a new area of inquiry for philosophers, art historians, psychologists, and artists. 8. The exercise of 48 hours of silence is one I have adapted from an assigned exercise I did as a student, 1973, in a course in Primitive Art taught by Karen Thorsen, then a doctoral candidate in Folklore at the University of Pennsylvania. 9. The Kalingas, an indigenous people of the Philippines, count six; the first, and foremost for them is “talking” (Robert Lawless, email to MK, 3 July 1997); another group in India count 16, including “equilibrium” among the basic bodily senses (Axel Thiel, email to MK, 3 July 1997). 10. 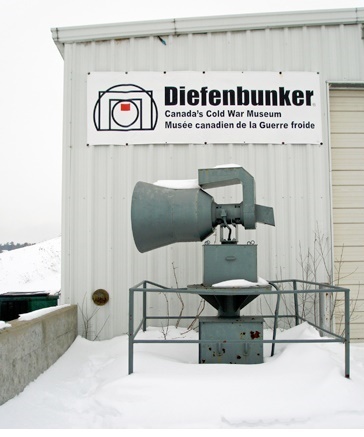 The “Diefenbunker” is named for Prime Minister John Diefenbaker whose government authorized its building. Construction began in 1959 and was completed in 1961. 11. 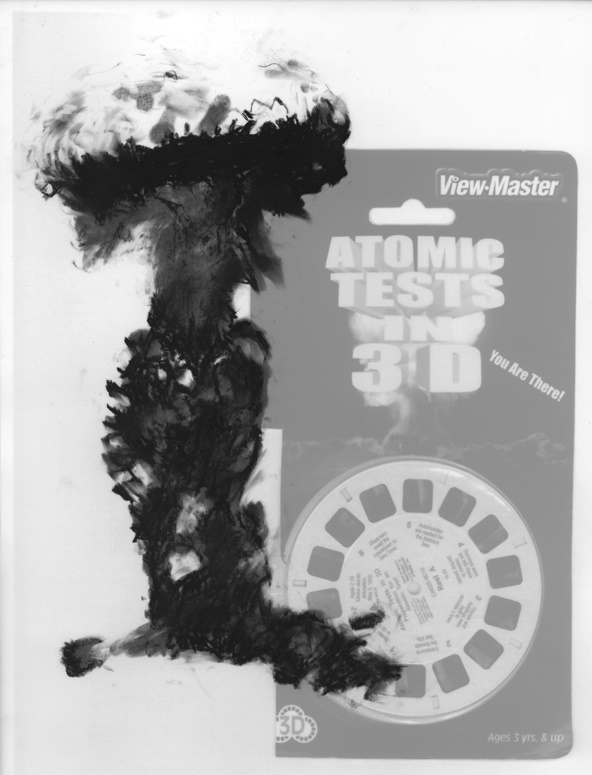 The pinhole camera exposures were made by Maggie Knaus and Giuliano Pirani. 12. William J. Broad and David E. Sanger, “US Ramping up Major Renewal in Nuclear Arms,” New York Times, Sept. 21, 2014. 13. Marina Galvani to MK, email, 6 October 2014. 14. All quotes are taken from the catalogue Hanifa Alizada: Through the eyes of a Woman, Washington, D.C. World Bank Art Program, 2014.